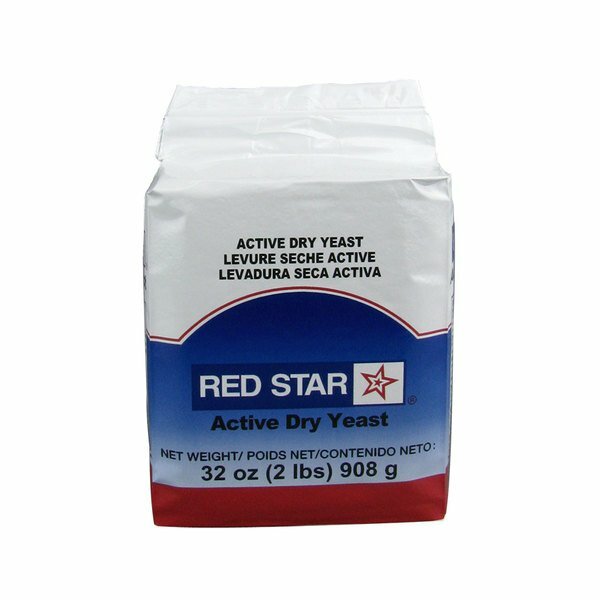 Lesaffre Red Star bakers active dry yeast 2 lb. vacuum pack can be used in all yeast-leavened goods, making it a versatile option for any bakery, pizzeria, or restaurant! The airtight vacuum packaging helps to extend this yeast's already lengthy shelf life by keeping moisture out. When you're ready to use it, simply dissolve the yeast in warm water before adding it into your ingredient mixture! Yeast converts sugars found in dough into carbon dioxide, causing the dough to expand. This process is what helps give bread the soft and airy texture we all know and love! This 2 lb. bag of active dry yeast is perfect for making pizza crust, round loaves, or long "French-style" breads. See nutrition for more information. This is a nice basic dry yeast great thing is it come vacuum packed so if you already had some and just want to make sure you have some when you need it this is a great buy. It is very good guality . It works as Majic . It can be stored for long long time. Beside It is a very Good buy. What else to expect . Great Value, gone are the days when I'd spend a furtune on jarred and packets of yeast. This is alottttt of yeast so be sure to store it correctly. This is my favorite yeast. Better then what I can buy at the store. I make my own breads at home, and they rise perfectly. I also add it to waffle mixes, and the size ensures that I always have plenty on hand. This is a no-brainer, folks. Red Star yeast, in bulk. If you keep it in a sealed, air-tight container, in your fridge, it will keep active for years, if you don't use a lot of yeast, and if you do, you won't be disappointed by this product in the least. Always proof your yeast, no matter what, however, because it gives it one hell of a boost, and is an amazing time-saver in the end. When my family calls for pizza, I use a ton of the stuff, and then it sits in my fridge for months until the next time. It makes great home-brew sodas, too! After experimenting with several kinds of yeasts, this brand and kind is what I depend on. Red Star Acitve Dry yeast helps to create perfectly risen baked goods every time. It is a consistent product and easy to use in this dry form. A great product. Have used the Red Star active dry yeast for at least a year now and have had success in making whole wheat bread for our bakery. Great price and works well. We use it for all our bread and rolls. I love that is comes Vacuum packed in order to keep it fresh till we need it.. I use this yeast every week to make wheat bread for my clientele and they love it. I can count the times it has failed on one hand. I will continue to buy this yeast for years to come. I like to make lot's of different kinds of breads and pastries and Red Star really does it for me, so I tend to stick to winners. I divide by half and throw one in the freezer and the other that I use actively on the top shelf in the fridge. Good product. Red Star is my favorite,as a home baker. It is reliable and I can keep the unused portion in my freezer until I need it. I have never had any problem with it! This is also such a great price for it!